HE SAILED ACROSS THE SEA OF GALILEE till he came to the eastern shore, where the steep cliffs of the Bashan Plateau drop close to the brink of the water’s edge. Here the slopes descended so swiftly, almost into the sea that local animals already started downwards, could not avoid plunging headlong into the depths. This was the country of the Gergesenes, where ancient catacombs peep out like dark baleful eyes from the face of the hills. It was here that he came upon the demoniac from the tombs. Hardly had he stepped from the boat, his followers close behind, when a ragged figure came running wildly towards him from one of the tombs, waving his arms and calling out. Dropping to his knees instantly, the man began gibbering incoherently and gesturing with raised hands. “Come out of the man, thou unclean spirits,” Jesus demanded thunderously. At this, Legion began trembling and moaning and gibbering uncontrollably, and clapping both hands to his temples, called out in a strange, strangled voice. Hands on hips, legs spread apart, Jesus stood staring at the man with a scowl darkening his bearded features. Then he shouted, “Shut up! Shut the bloody hell up,” in such a loud voice, that the man instantly stopped gibbering and looked up at Jesus in utter shock and disbelief. Legion nodded dazedly, lost for words and temporarily jolted into sober silence. He held out a hand and lifted Legion to his feet with such force that he nearly catapulted him into the air. Jesus stood there, stroking his bearded chin as he studied Legion critically. “Uh. I – I guess not,” whimpered Legion uncertainly, adjusting his grimy rags. “Eh? Legion was quite disoriented and confused by the forbidding and dominant presence of this big, self-assured man. Suddenly Jesus loomed menacingly over him and clamping a hand palm down upon the top of his head, pushed hard, almost grinding him into the soil, while he cried out in such a loud and powerful voice that Legion almost passed out. Then Jesus released his grip and stood back a pace, staring up at the sky, his arms outstretched, fists clenched and shaking, while he bellowed incoherently upwards like a wild beast proclaiming its territory or challenging a rival. The sun that had been shining so brightly moments earlier now disappeared swiftly behind dark clouds that had moved rapidly in overhead. Again, Jesus stepped forward, clapping a palm upon Legion’s head and began roaring in an awful frenzied fury, his face, horrifyingly distorted and savage, the huge black orbs of his eyes, so round and terrifyingly intense and penetrating within the swirling white oceans surrounding them. Hearing the commotion from afar, those who were tending the swine upfield had come over to join the men gathered round Jesus and the demoniac. Pulling their robes more closely about them against the chilly breezes wafting in, they stood nearby in a stunned and spellbound silence, but soon, a low buzz of hushed comments and whispered asides rose up amongst them. “And some pretty horrific grimaces and very obscene postures and gestures, too! Eyes shut and seemingly unaware of what he was doing, the demoniac began screaming and wailing in a series of convulsive fits, then such an alarming stream of lurid invective suddenly poured forth from his gaping mouth that it would have made even Bernard Manning flinch. One of the swineherds leaned forward urgently, his brow furrowed in concern. Eyes still shut, his body swaying to and fro; Legion began gargling and foaming at the mouth. Within a whisker of complete oblivion, the only thing, stopping him from falling over, was the sheer power of the steadying palm that held him. So when suddenly Jesus released his grip with a tremendous howl, Legion sank to the ground and lay there, his eyes springing open and staring dazedly up at a sky now quite clear and blue, while something like swirling wind spiralled upwards and curved over towards a distant herd of swine foraging obliviously by an olive grove. The swineherds hurried off urgently to return to their charges, which now began to act in a most peculiar and restless manner. “There! That’s what you might call sheer expulsive therapy,” breathed Simon. “He raises an arguable point, though,” Thaddeus said thoughtfully. “Do you then, all of you, doubt the validity of what you have just witnessed?” Jesus asked. The men gathered behind Jesus shuffled their feet nervously and murmured amongst themselves. “I know just what you’re all thinking,” said Jesus. “Well, it isn’t too hard to guess, is it?” Judas replied. An expression of bafflement flashed across Judas’s face. Then Jesus gave him such a penetrating, discomfiting look that a shiver rippled across his shoulders and down his spine, and a sudden spasm gripped his features with an uncontrollable outbreak of twitches and quivers. Holding Judas’s gaze for a further long instant, Jesus nodded all-knowingly and turned away with an amused half-smile tugging his lips. Oh, the powers of intimidation and autosuggestion thought he, reflectively and fell to musing. With a sudden jolt, Jesus broke out of a seemingly long and profound but actually very brief reverie, realizing that he was standing quite motionless, hand cupping his chin like some timeworn Greek sculpture, deep in thought. He heard voices all around, their meaning slowly reaching him and sinking in. “That doesn’t mean it was anything supernatural,” said Thaddeus. “Leave it out, Thomas! Since when did you ever agree with anything?” Several voices protested from several directions in unison. They all stared downslope towards where the calm surface of the sea reflected silvery in the sunlight, as if nothing had disturbed its tranquility mere minutes earlier. Then they turned around to face Jesus, whose black beard and bronzed skin reflected blue and amber highlights under the light of the sun. As dawn broke the next day, Legion, appropriately attired in a brand new Christian-style outfit was sitting calmly at breakfast like any average sane man untroubled by demons, when Jesus approached him. Jesus waved a hand dismissively. Jesus stroked his hawklike nose, and checking that the vicinity was clear of the host of inquisitive visitors arriving that morning, leaned forward conspiratorially. Legion had stopped eating his breakfast and was staring at Jesus in complete wonderment. “I’ve really got to find some way of wriggling out of that one,” said Jesus fervently. “I just don’t fancy it at all. Maybe I ought to get a contract out on Judas; he’s the bugger that’s supposed to fit me up. Eliminate him and it could just swing the balance in my favour. He’s scheduled to commit Hara-kiri after the betrayal, anyway. So!” Jesus shrugged. Legion still sat staring at Jesus, mouth agape; food like a soggy wad of dough visible on his tongue. He resembled some goggle-eyed antique statue, frozen in mid prandial mastication. Legion suddenly spluttered and ejected a large bolus of his breakfast onto the grassy soil, several metres beyond the table. 3 And he had his dwelling among the tombs. And no one was able to bind him anymore, even with a chain; 4 because he had often been bound with shackles and chains, and the chains had been torn apart by him and the shackles broken in pieces, and no one was strong enough to subdue him. 5 Constantly, night and day, he was screaming among the tombs and in the mountains, and gashing himself with stones. 13 Jesus gave them permission. And coming out, the unclean spirits entered the swine; and the herd rushed down the steep bank into the sea, about two thousand of them; and they were drowned in the sea. 14 Their herdsmen ran away and reported it in the city and in the country. And the people came to see what it was that had happened. 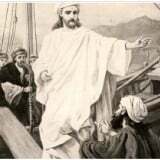 The miracle referred to took place, without doubt, near the town of Gergesa, the modern Kersa, close by the eastern shore of the Sea of Galilee, and hence in the country of Gergesenes. But as Gergesa was a small village, and little known, the evangelists, who wrote for more distant readers, spoke of the event as taking place in the country of the Gadarenes, so named from its largest city, Gadara; and this country included the country of the Gergesenes as a state includes a county. The Gerasenes were the people of the district of which Gerasa was the capital. This city was better known than Gadara or Gergesa; indeed in the Roman age no city of Palestine was better known. “Gerasa became one of the proudest cities of Syria.” It was situated some 30 miles southeast of Gadara, on the borders of Peraea; ‘the country beyond’ in Greek, a portion of the kingdom of Herod the Great, occupying the eastern side of the Jordan River valley about one third of the way down from the Sea of Galilee to about one third of the way down the eastern shore of the Dead Sea; and a little north of the river Jabbok, (a tributary of the lower Jordan river). It is now called Jerash and is a deserted ruin. The district of the Gerasenes probably included that of the Gadarenes; so that the demoniac of Gergesa belonged to the country of the Gadarenes and also to that of the Gerasenes, as the same person may, with equal truth, be said to live in the city or the state, or in the United States. For those nearby the local name would be used; but in writing to a distant people, as the Greeks and Romans, the more comprehensive and general name would be given.
. . . This describes the district in which Christ met and healed the demoniac from the tombs, where also took place the destruction of the swine . . . The country of the Gerasenes (Gergesenes) was on the eastern shore of the Sea of Galilee and must have been a locality where the steep edges of the Bashan plateau drop close upon the brink of the lake. This condition is fulfilled only by the district immediately south of Wady Semak, North of Kal ‘at el-Husn. Here, the slopes descend swiftly almost to the sea, and animals, once started on the downward run, could not avoid plunging into the depths. Many ancient tombs can be seen in the face of the hills.